This post will cover installing PostgreSQL 9 on cPanel. The OS is CentOS 5.5 and cPanel/WHM version is WHM 11.30.2 (build 1), but below should work for other releases as well. We will start with the general installation and configuration and then see how to compile support for PHP, Perl, PDO, Python, and others. Instructions are the same for PostgreSQL 9.0.x and 9.1.x. Just use the appropriate files names for the version you are installing. It is important to note that cPanel supports ONLY the release that is available via the CentOS distribution (or Fedora or whatever supported distribution you are using). By installing or upgrading to PostgreSQL 9.x, you will not be supported by cPanel. The order of the steps below may seem idiosyncratic, but this order is what I have found to work. As of PostgreSQL 9.x, the directory structures of PostgreSQL has changed. In brief, installing PostgreSQL 9.x on cPanel simply requires creating the needed symlinks so that cPanel can find the files where it is looking for them (i.e. in the >=7.3 locations). Download the pgdg-centos-9.0-2.noarch (or pgdg-centos-9.1-3.noarch for 9.1) and upload to your server, or simply use wget. 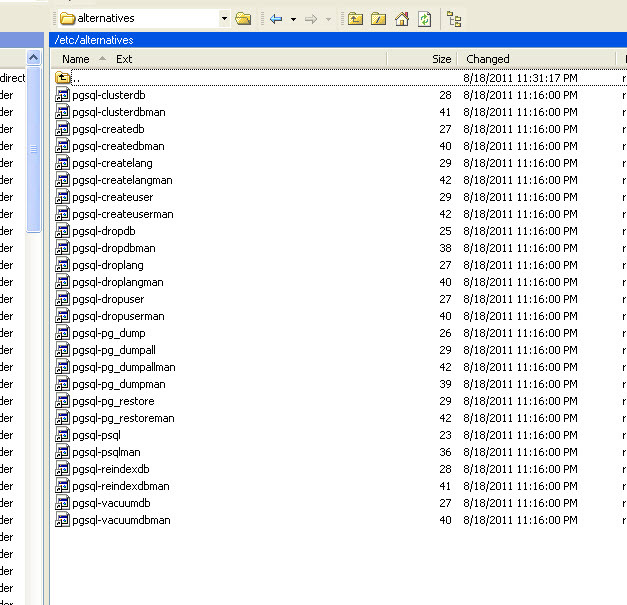 Now, let's check everything is ready to install using yum list postgres*. The directory structure for PostgreSQL has changed with release 9. So, we need to create some symlinks from the new location to the old locations (where cPanel is expecting to find the files). The above will create the required symlinks as shown below. Now, initialize Postgres but do NOT start it. My explanation of this part of the process is going to be a bit verbose. So, let's first give a quick summary of the steps we will take in this section. 5. 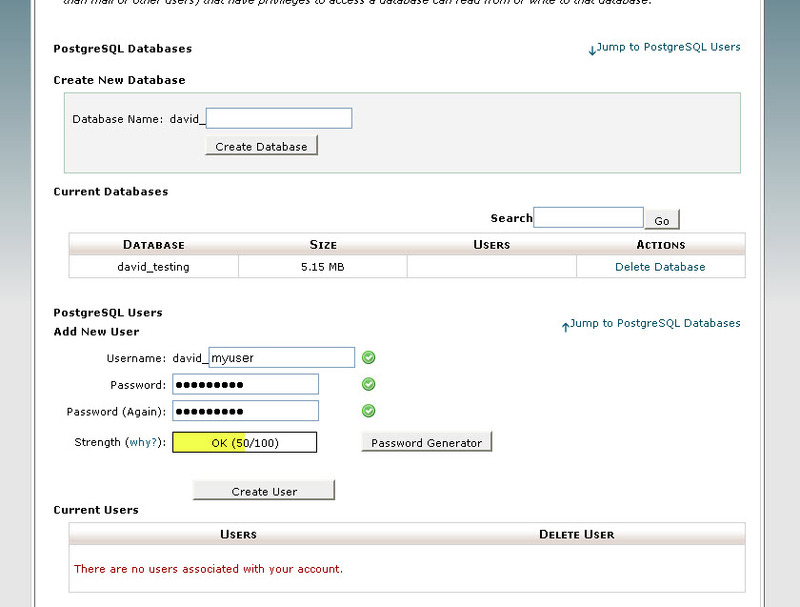 In WHM, Got to Main >> SQL Services >> Postgres Config. In the Create Postgres Users section, click the Create Users button. If you like, you can simply follow steps 1 to 6 above and then move on to next section (Step 6: Check cPanel and PhpPgAdmin Functionality). However, if you take a few extra minutes to go through the full explanations below (5a to 5e) it may help to avoid problems and provide a better understanding. To get PostgreSQL and cPanel communicating correctly and securely using md5, follow steps 5a to 5fbelow in the order shown. This now has md5 listed as our authentication method but at this point it will NOT work correctly. Waiting for postgresql to restart...............finished. 5d. Change the Postrges Password. 2. In the Postgres Password section at bottom, enter and confirm a password for the user postgres, and click the "Change Password" button. Now, note that if we go back to our pg_hba.conf file in /var/lib/pgsql/9.0/data, we will see that the authentication is no longer 'trust' but has now been returned to md5. 2. 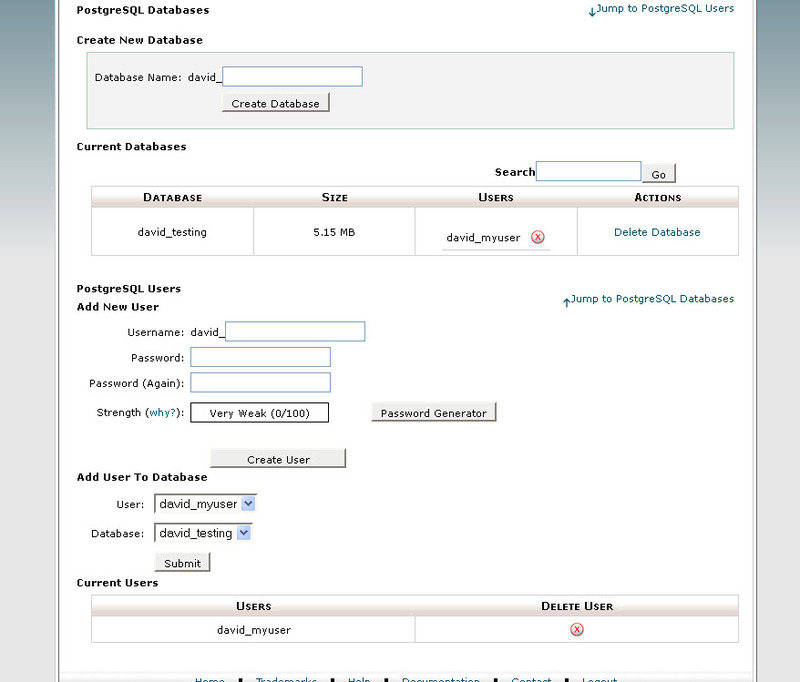 In the Create Postgres Users section, click the Create Users button. Now that we have completed the initial configuration, we should log into a cPanel account for a user and test functionality. IMPORTANT: When testing functionality, do NOT open the users cPanel via WHM. If you do this, PhpPgAdmin will appear not to work. Rather, open a new browser and log into an cPanel normally as the end user. Use PhpPgAdmin to create a table and insert some data. Since I will be using this database, table, and user to check my PHP other functionality below, before proceeding I'll just check what our data should look like using the command line (you can use PhpPgAdmin as well). When we first installed PostgreSQL 9 above, the installation automatically created a number of useful symlinks under /etc/alternatives as shown below. These are links into the CentOS /usr/bin directory from the new /usr/pgsql-9.0 directory where PostgreSQL /bin, /include, /share, /lib, and others are now installed as of PostgreSQL 9. However, the file that we need to compile support for PHP, Perl, PDO, etc.. does not have a symlink created automatically. 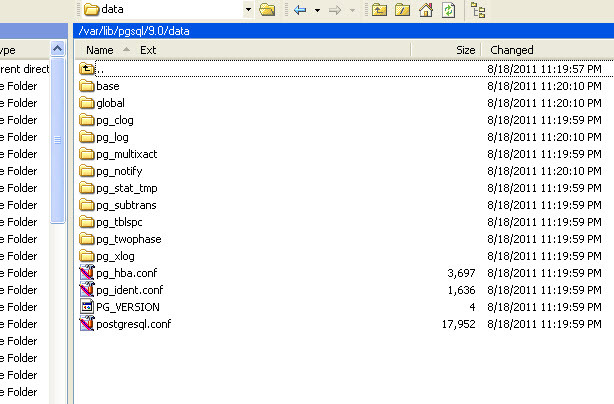 The file we need for this is the pg_config file located under /usr/pgsql-9.0/bin. Now, we are able to compile support for PHP, PDO, Perl, and the rest. You can now compile PHP support for PostgreSQL in WHM via EasyApache (Apache Update) as you normally would. Once EasyApahce completes, create a phpinfo() file in your domain and verify that PHP support now shows up. Be sure to substitute the db, username, and password with your own. Note: if you get an error, log into either PhpPgAdmin, or the command line and grant select, and other privs you want, to the user you created on the table you are testing. When installation successfully completes, restart Apache and check your phpinfo() file to see if PDO for PgSQL has been added. 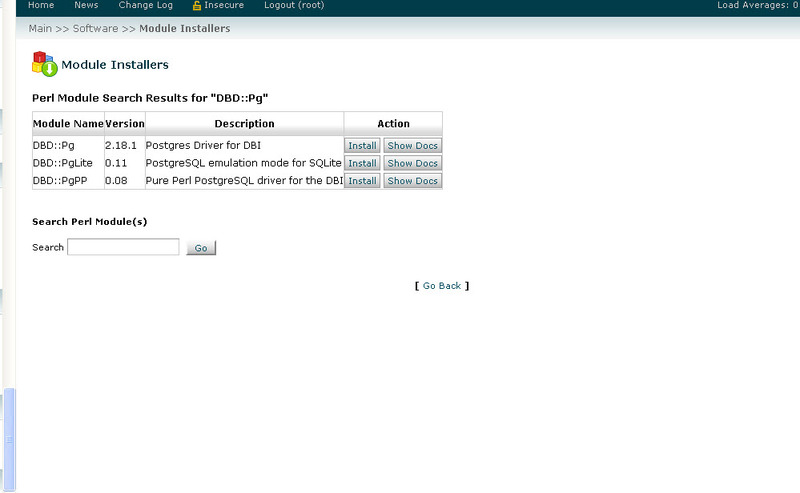 You can test your DBD::Pg functionality with something like below. Save the code as test.pl in the user home directory. Above, in step 1, we installed postgresql90-contrib. 1. Install PostgreSQL 9.x using the PostgreSQL repo and yum following steps 1 to 4 above. 2. Initialize the new cluster (e.g. postgresql-9.1 initidb). Once upgrade has completed, you can continue with the remaining configurations for WHM, etc... above. Good morning, very good and very detailed tutorial thanks for the input. I commented that I did all the steps and install postgres on my server iweb So far so good, but when I try to run the phpPgAdmin link that came out (./3rdparty/phpPgAdmin/index.php) did not exist. I hope you can help me indicating that it may be happening or what I overlooked, Greetings and thanks Antel. It sounds like phpPgAdmin did not get installed. Thanks a lot, my problem you solved. Problem: root@server [/etc/yum.repos.d]# service postgresql-9.1 initdb Initializing database: [FAILED] I had no errors on previous steps otherwise. Is this an upgrade or a new install? grep postgres to see if it is already running. Check the logs under /var/log and postgres logs for any errors. This is a new install. 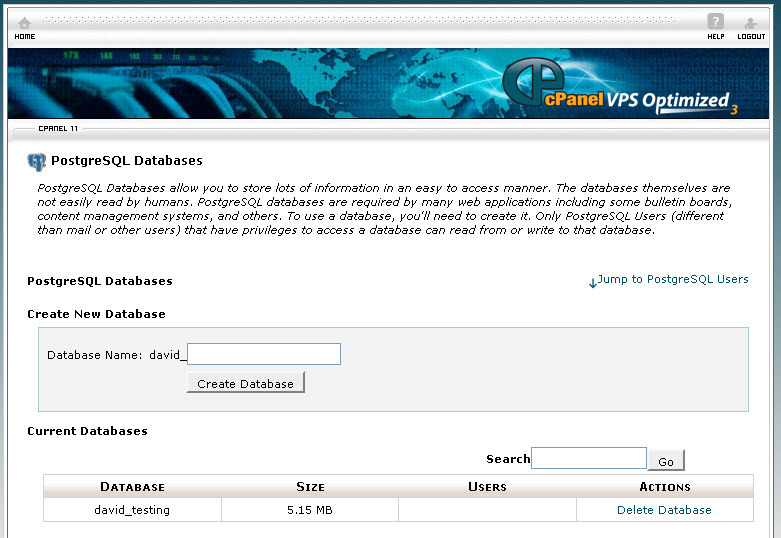 By the way, how do we do an upgrade on a cpanel shared hosting environment form 8x to 9x without losing databases? Thanks for your help. This is a new install. Also, if I do an upgrade on a production environment how do I back up live PG databases safely? Thanks. Did you do/check any of the items I suggested above: grep, sys logs, pg logs, 5432....? Problem now I cannot init server. Which version did you install from the repo? I've updated my PostgreSQL but I still have a problem with my libs. I've currently PostgreSQL 9.1.3 but in my phpinfo it's still 8.1.23. Can you help me to fix it? How can I change it? Did you run EasyApache update? ln -s /usr/pgsql-9.0/bin/pg_config /usr/bin That command just saved me a ton of headaches! Thank you so much! Thanks a bunch. This article saved me a bunch more time and headache. I had a good idea this was the problem, but I didn't know all the specifics I needed to make it work. Luckily for me, you did! Today, one of our customers open a ticket asking how to create 'tablespace' using phpPgAdmin. I check to try to create it, and it's true. No permission. But if you click in Select Owner from TABLESPACE in phpPgAdmin, ALL ACCOUNTS will be listed. In my vision this is a big security role problem. Hoping for some guidance/help/answers. Thank you ! Hey David, great how-to! Thank you. I suggest adding in phpPhAdmin upgrade as part of the how-to, the version with cPanel is out of date. If someone access it as a superuser they will run into some problems. This worked flawlessly with Postgresql 9.2 and phpPgAdmin 5.0.4. If you click in Select Owner from TABLESPACE in phpPgAdmin, ALL ACCOUNTS will be listed. In my vision this is a big security role problem.